4.5″ high non-tunable bongos; Acousticon shells. 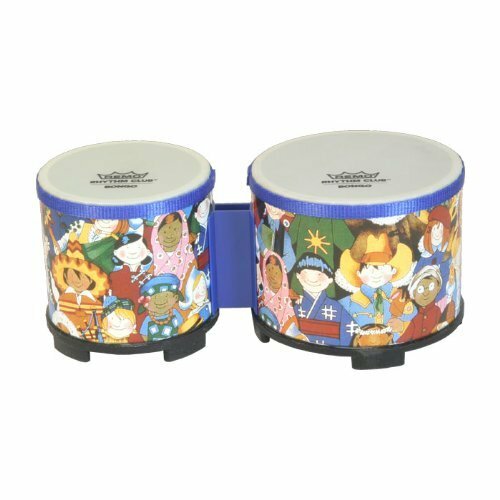 Features the Rhythm Kids design FabriFinish. 5″ and 6″ diameter fixed synthetic heads. Trim color may vary from pictured. Built well and prepared to take a beating As a musician I have owned various Remo products in the past and while these aren’t professional quality by any means, they are a fun, sturdy starting point for someones little fingers. The built in legs keep them just high enough off of the surface to allow the drum head to resonate (except on our medium pile rug) and they are strong enough to handle a smashing (I often find him beating on them with my drumsticks). The drum heads are not tunable, but they do sound quite nice right out of the box. The good thing about these is the sound actually gets better over time. As they loosen the tone gets nice and mellow. We used to keep a few of the earlier models of these Remo drums in the studio for recording because they had a surprisingly nice tone, nothing has changed there. Another bonus is I often find myself playing along to his favorite () music with them while he dances around the room.The images on the drums themselves are of all different types of people and offer a form of entertainment in themselves. Often our son will become disinterested in actually drumming, but he’ll sit there pointing at and asking questions about the various faces that are featured all over the drums.For those of you about to click Buy I have a suggestion: out of the box the wing nuts should be checked for tightness. Ours came a little loose and the drums could twist a few degrees in each direction. My experience as a drummer also reminded me that after I tightened them down to put just a drop of Loctite THREADLOCK BLUE 6 ml. 24200 on each screw to keep the nuts from backing off over time.All in all they were definitely a good buy. We both enjoy them immensely and I expect they’ll be here for the long haul. Bongos that grow with your kids My son got these for his 4th birthday. He is now 6 and continues to enjoy them. They are really sturdy and are even fun for use by adults! Worth the money and the ear plugs! Good bongos for the money. These are great for kids. They don’t need to be “tuned” (adjusted) so they are always ready for play. Got them for our twin 5 year olds last year. At 6, they’re still playing with them regularly.